Lewis Hamilton joined the great Juan Manuel Fangio as a five-time world champion after finishing fourth in the Mexican Grand Prix, Max Verstappen recording a popular win from Sebastian Vettel after Daniel Ricciardo’s late retirement from second. US Grand Prix winner Kimi Raikkonen finished on the podium, but the day belonged to the man who would surely savour the champagne somewhere else later in the evening. That Hamilton himself is a great of the sport has never, ever been in doubt. That accolade gets bestowed on many drivers who have won a brace of titles, let alone three or four more. Hamilton only needed to finish seventh regardless of where title rival Sebastian Vettel finished and not being on the podium may have come as a disappointment. He’s a serial winner and wanted to nail down the championship in style. Although the win eluded him, it was understandable that emotion overcame him after he crossed the finish line when the enormity of his accomplishment hit him. “It’s a very strange feeling right now but I think I firstly want to say a big thank you to all the fans here really for making the Mexico Grand Prix as special as it is,” said the newly crowned champion. “Secondly, I want to say a big thank you to my team who, as I said on the radio, it wasn’t won here. It was won through a lot of hard work through a lot of hard races so I’m so grateful for the work back home, for all our partners, for Epson, for Petronas, for Bose that’s been a part of it. After a season-long duel with arch-rival Sebastian Vettel, it was never going to be an easy ride. Some puzzling Ferrari strategic errors gave Hamilton a helping hand when it seemed that the Scuderia held the upper hand post-Belgium. Yet Hamilton remained focused and unflappable. 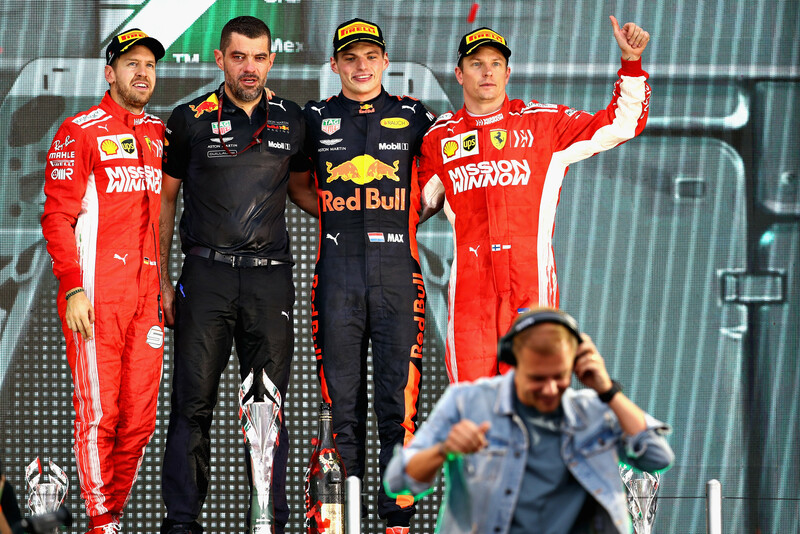 Top three finishers Max Verstappen, Sebastian Vettel, and Kimi Raikkonen celebrate on the podium at the 2018 Mexican Grand Prix. © Mark Thompson/Getty Images. Starting third on the grid behind Ricciardo and Verstappen, altitude seeming to help the Red Bull engine and aero package in conjunction with the high track temperature and tyres, Hamilton still had much work to do. And it was a great start by the Mercedes man, out-dragging pole sitter Ricciardo into the first corner, Verstappen doing one better to hold the lead. It was, however, a disappointing start for Esteban Ocon, the Racing Point Force India driver contacting Fernando Alonso into Turn 1 as behind the leading protagonists, Vettel, Bottas and Raikkonen maintained their starting grid slots. Free practice and qualifying hinted that on this abrasive circuit, amidst thin atmosphere, tyre stops would be crucial. The top six all started on the quickest wearing ultra-soft tyres and a virtual safety car situation on the fifth lap, caused by the luckless Fernando Alonso stopping by the side of the track, led some teams to pit. Hamilton stayed put but reported with some alarm that his tyres were becoming fragile. He duly came in for a fresh set of super-soft boots on lap 13, a 2.3 second stop putting him in perfect shape for the second period of the race. The Red Bulls stayed out, banking on a one-stopper that would see them to the end. The gamble paid dividends, and it appeared that a 1-2 was nailed on but for Ricciardo’s late misfortune. The Ferraris also looked happier on the super-softs, but it quickly became apparent that another stop would be required before the chequered flag. A hugely gutsy move, with everything at stake, Hamilton decided to risk all and take Raikkonen around the outside of Turn 3 before the Ferrari driver’s stop. Just the kind of move that defines a true racer. A second virtual safety car, caused by Carlos Sainz’s retirement, gave Ocon and Perez the perfect opportunity to pit again but the remainder stayed put. And when Perez made a great move around the outside of Leclerc, a strong points finish seemed guaranteed. But that all unravelled on lap 41, the Mexican retiring to the despair of his adoring home fans. Vettel’s tyres working much better than Hamilton’s, the German made his move stick on lap 39, sweeping past the Mercedes and into second place. It all meant for an exciting finish. Trying to defend third from Ricciardo, Hamilton ran wide and over the grass into Turn 1 and immediately pitted for a final set of tyres. Vettel did likewise but in the grand scheme of things, it put Hamilton into a comfortable fifth, which would become fourth after Ricciardo’s eighth DNF of a luckless season. Although the driver’s title is done and dusted, all is still to play for in the constructors’ championship. Mercedes needed to outscore Ferrari by 20 points but both Ferraris finished ahead of the Mercedes duo. Nico Hulkenberg, Formula E-bound Stoffel Vandoorne, Marcus Ericsson and Pierre Gasly rounded off the points-scoring finishers. Although the constructors’ battle continues, for one man, the dream of a fifth world title is over. For now, at least. Hamilton’s fifth world title came on the 50th anniversary of Graham Hill winning the Mexican Grand Prix in 1968. Top image: 2018 Mexican Grand Prix, Sunday. ©Wolfgang Wilhelm. Sports news and features writer, web editor and author.